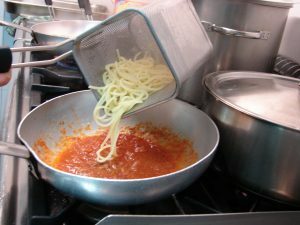 Last week I asked: How do you make “traditional” spaghetti sauce? Rome, Italy, may be called the “Eternal City” but Rome actually started several miles southwest of present-day Rome in a place called Ostia. 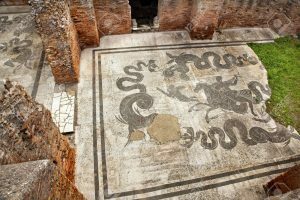 Today Ostia Antica is an archeological site near the modern resort town of Ostia. 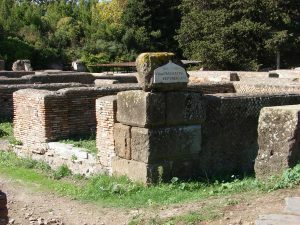 Two thousand years ago, Ostia Antica was located at the mouth of the Tiber River making it an important commercial city with a population of around 60,000. It declined as the harbor silted up eliminating its place in the trading market and making way for the growth of what is Rome today. 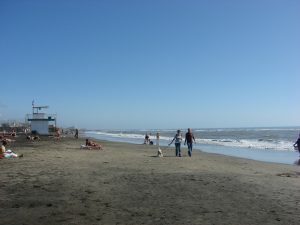 Ostia, today, is a beach resort. I think, we Americans, think that we have the most advanced culture that ever existed and in many ways that’s true; but often we don’t appreciate the high level of culture and lifestyle a thousand or more years ago. There are frescos that have survived in homes. The frescos served the same function as wallpaper does today. In the early 1800s itinerant painters would travel around the United States and stencil designs on the walls of people’s homes in exchange for room and board and/or a pittance in pay. In the Ostia Antica Museum there are statuaries representing religions of foreign land. Being a port town, Ostia welcomed people from all over the world and tried to meet their religious needs. The theater is one of the oldest brick theaters anywhere and concerts are still held there today. 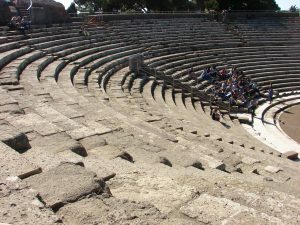 The three rows of marble steps near the orchestra was for the rich. Today orchestra seats are still the most expensive. It was fun walking down the main thoroughfare past the stores. The hub of life centered around the government-subsidized, easy affordable baths. There were marble steps for lounging and doing business. They led to the pools. Olive oil was used instead of soap so the water was skimmed periodically by servants. It was the end of the beach season in Ostia so many restaurants were closed but we found a small, family-owned restaurant near our hotel called, Officina Cusinia. I am often puzzled how people identify us as Americans even before we speak. While we were eating, the owner, Giovanni Ciaravola, said he knew we were Americans because we twirled our spaghetti on our spoon. 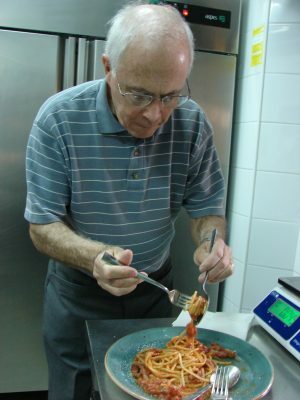 The correct way, he said, was to just twirl the fork or put the tines on the plate and twirl it. I said we probably don’t make the sauce the Italian way. 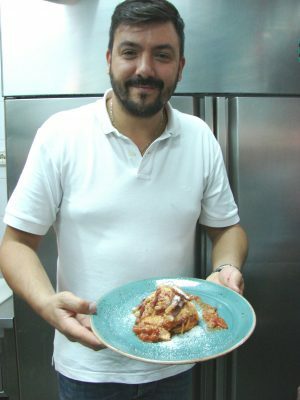 He agreed and said he would be making sauce the next day about noon and if we wanted we could return and learn the way to make traditional Amatriciana Italian sauce – the “right way” to make it. 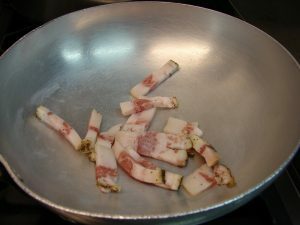 Cook pork jowl over medium heat so the fat cooks out and the pork jowl is slightly crispy. Add tomatoes, cover (it will lose some red and become more orangey), stir occasionally until it thickens – about 15 minutes. Add a couple drops of oil to make it look shiny. Mix, Boil water then add pasta cook; until el dente. If the sauce is too thick, add some pasta water. Add to the cooking pan. Travel Trivia Tease™: Where was “Crazy Rich Asians” filmed?